Preheat oven to 350 degrees. Coat 4 ramekin bowls with cooking spray and place on a large baking sheet, set aside. You can also use a an 8-inch pie plate.In a large saucepan, combine apples, brown sugar, lemon juice and water. Cook over medium heat until apples are tender. 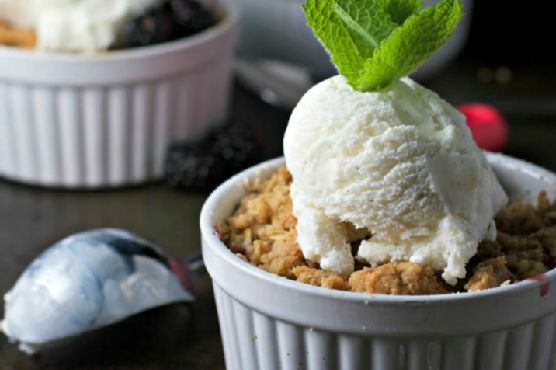 Transfer apple mixture into ramekin bowls and top with blackberries.In a large bowl, combine flour, oats, sugar and ginger. Using a pastry blender or fork, cut in solid coconut oil or butter until a crumbly topping is formed, you may need to use your hands! Add topping to apple and blackberry mixture. Transfer to oven and bake for 25-30 minutes or until bubbly and golden on top.